In April 2016 I moved out of a gallery space in downtown Grand Rapids, MI. The gallery was an intimate 300(ish) square foot white-cube space with polished wood floors, big store-front windows, and a living space in the back. A grad student's dream! I managed exhibitions in that space, affectionately called Craft House, for three years. Now, without the constraints of a physical location, the need for regular open hours (I never was very good at that), or the cash to pay rent each month I can continue to recognize, celebrate and engage with local artists and visual art projects. I'm looking at painters, drawers, sculptors, assemblagists, ceramicists, printmakers, photographers, street artists, fiber artists, visual arts organizers, curators, and more. I'm most interested in artists and projects working outside the institution, though I still love a well-curated museum exhibition. And I especially want to support those visual artists making significant contributions to the conversation who aren't getting enough recognition. Invite me to your show! Share your work. I might share it too. It’s true, Sofía Ramírez Hernández draws every day. Since 2013 she has filled more than 70 handmade sketchbooks in the dimensions of a small paperback but with fewer pages. She works in reverse, cutting sheets of paper, drawing on them, and then after a few weeks of shuffling around on her desk she binds them into books. Sofía is small and brown with a close-cut bob of dark hair and big bright eyes that look out from sheared straight bangs. She’s cool and quick with a joke. When she’s not drawing she’s biking or running or swimming, having recently gotten hooked on endurance sports. She describes her commitment to drawing everyday as “non-negotiable,” and talks about it as if it were as important as breathing--long laborious breaths that exhaust and nourish simultaneously. To look at a collection of 100 or so of her daily drawings feels a bit like peeking into someone’s diary. You can see a crap-ton of them on view at the Saugatuck Center for the Arts through August 12, 2016. 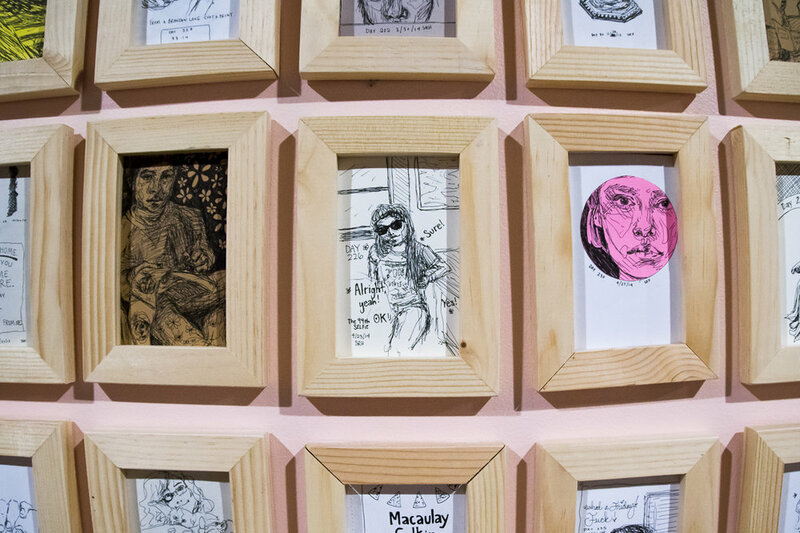 Each drawing is approximately 3.5 x 5.5 inches and every one is different; self-portraits as cute, fuzzy animals are butted up next to emotionally raw text/image illustrations and each one is contained in a thick raw pine wood frame. At SCA they are displayed in a dense grid format, equal parts overwhelming and magnetic. I first met Sofía as a scrappy undergraduate printmaking student at Kendall College of Art & Design in 2012. She was drawing septuple-layer burgers and printing these incredibly intricate etchings that were a visual hybrid of diary entries and dreamscapes. I remember being impressed at how well she could write backward, with a tiny metal stylus, on copper. A few weeks ago I met up with her at Saugatuck Brewing Company after she spent the day painting, sharing stories, and generally hanging out with 150 kids between kindergarten and 8th grade as part of her residency with Growing Young Artists--a residency program of the SCA focused on supporting migrant workers’ children. More about that in a minute. Sofía graduated from KCAD in May 2014 and in the fall of her senior year, 2013, started making at least one drawing everyday. Initially, it was a way to avoid the post-art-school slump but soon the act of drawing everyday took on a cathartic quality; it became not just an outlet but an endurance sport and a way to combat self-destructive behaviors. The day we sat down at SBC was day number 1,045 and Sofía confidently acknowledged that she’d only missed one day, maybe two, in the last three years. She drew through a series of not-so-rewarding service industry jobs, the struggle to find creative work, and a particularly bad breakup. Drawing everyday was a way to connect with others by sharing her most vulnerable moments and finding that other people had similar experiences. Some days a successful drawing was a simple pen mark on a blank page, other days she produced detailed illustrations of significant and painful moments, like the self-portrait from day 156 where bold block letters across her face spell out “Relapse one day get promoted the next.” She’d share these images online and the responses were usually robust. She could gage which drawings were the most successful on days that the comments section of her most personal posts built to a crescendo of consternacious encouragement and so she continued to draw, and share. To say that the #sofiadrawseveryday project has lead the artist to a greater understanding of her own abilities is an understatement. As we sat at the bar in Saugatuck our conversation shifted from my questions about her creative practice to her childhood feelings of ‘otherness’ and her initial resentment of Frida Kahlo (and eventual adoration) to her current interest in a diverse range of media, narrative, and social justice projects. She looks at artists like Wayne White who prizes humor in expression and WIlliam Kentridge who is never satisfied with just one artform and fluidly moves from animation to opera to drawing and back again. Drawing everyday opened a portal for Sofía into a world of shared narratives and vulnerability that ultimately pointed her in a new direction, toward artmaking that matters, artmaking that helps other people. Sofía calls this her “art and…” and recognizes that when she graduated from KCAD in 2013 she wasn’t completely sure what her “and” was going to be. What motivated her to make art? How could she sustain a comfortable lifestyle making art and still feel intrinsically satisfied? For Sofia it’s art and social justice. At the intersection of art and social justice are projects like the Saugatuck Center for the Arts’ Growing Young Artists initiative. Sofía was recommended as this year’s artist-in-residence for the GYA initiative by last year’s artist-in-residence Salvador Jimenez Flores. Sofía proposed an ambitious project for the multi-week residency; she would collaborate with the two groups of students, one in Fennville and the other in South Haven, on a puppet-show-style performance. The narrative would be an original story told by Sofía and acted out by the students using large-scale characters constructed from cardboard, paint, paper and whatever else they could find. When her proposal got the green-light in the spring of 2016 she was ecstatic. This would be her first paid residency experience and it would include housing for the duration of the project. When we met to chat she was in the middle of the residency, she’d led the students through sketchbook making activities, landscape drawing lessons, improvisation experiments, and they were finally starting on the construction of the puppets. The kids, as we referred to her students, were hesitant with her at first, shy and nervous about getting to know this new artist. The kids are children of migrant workers, some of which travel with the seasons to find work, others stay in West Michigan year-round with their families but live in less than ideal conditions. All of them share Sofía’s brown skin and dark hair and she felt buoyed by the little faces that mirrored hers. Soon they opened up, chatted comfortably and would leave her with hugs at the end of each day. When Sofía’s residency concludes they will all perform the puppet-show for their families and share the story they built together. So what’s next for Sofía? How can she make her “art and…” a regular part of her work life? Well, she’s still figuring that out but the opportunities have continued to find her. After her GYA residency she’ll spend a week at Ox-Bow Artist Residency where she also received a scholarship to attend a printmaking class. Then she’ll look for commission work, likely in sign painting (you can see her handiwork on Bartertown’s windows on Jefferson St. in downtown GR) or related graphic design or illustration work. She recently illustrated the real-life story of how a couple first met, as a commission for a friend, likely the most unique gift that significant other will ever receive. Whatever comes next for Sofía it’ll likely be big, bold, sort of quirky and definitely heart-felt. Like her artistic influences; Frida Kahlo, William Kentridge, and Wayne White (if you don’t know these artists stop reading now and look them up) she’ll continue to pursue a diverse array of media and tackle tough issues with humor and humility. She’s currently working on a bio-documentary with Tomás Calvo, Adam Bird, Anjalika Lobo, and Lauren Milligan that focuses on her daily drawings. I know I’ll be following her journey, hope you will too!